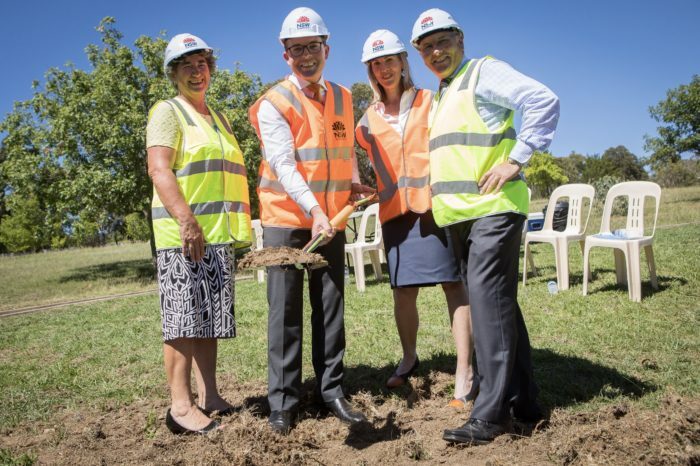 Armidale Secondary College Project Liaison Officer Kris Croft, left, Northern Tablelands MP Adam Marshall, Principal Carolyn Lasker and NSW Public Schools Educational Leadership Director Pat Cavanagh turning the first sod of soil on the $117 million new high school in Armidale today. THE first sod of soil was turned today by Member for Northern Tablelands Adam Marshall to formally begin construction on the largest education project in the region’s history – the new state-of-the-art $117 million Armidale Secondary College. The landmark ceremony to break ground on the new school was attended by local educational leaders, Armidale Regional Council representatives and builders Richard Crookes Constructions. Mr Marshall also released a new three-minute digital flythrough video, showing how students and staff will experience the new school when it opens on the first day of Term 1 in 2021. “Armidale Secondary College will usher in a new era for education in Armidale and country NSW, with the school featuring innovative technology and 79 flexible learning spaces that can be adapted for different subjects,” Mr Marshall said. The new campus, set to be built on the existing 18-hectare former Armidale High School campus, will cater for up to 1,500 students and deliver new school buildings with 79 new air-conditioned classrooms equipped with the latest technology, specialised spaces for industrial arts, hospitality and agricultural studies and improved performing arts and sports facilities. Armidale Secondary College will also be home to a state-of-the-art ‘smart farm’ allowing students to learn from the latest agricultural technologies and methods in a purpose-designed indoor and outdoor learning area. “Education and agriculture are both pillars of our local community which is why I am so proud to be delivering to our students a terrific new learning environment that offers the very best of both,” Mr Marshall said. Richard Crookes Constructions won the contract to undertake the project. The company is currently undertaking the $60 million redevelopment of Inverell Hospital and has previously completed the $16 million Moree East Public School, as well as the redevelopment of Armidale Hospital. Mr Marshall said there would be around 400 jobs created over the course of the two-year construction period, with the vast majority based in Armidale. “I want to ensure as much of the $117 million for the new school stays in the local economy and to that end, I am pleased that 20 per cent of the project workforce will also be apprentices and many local contractors will get work on this project,” Mr Marshall said.